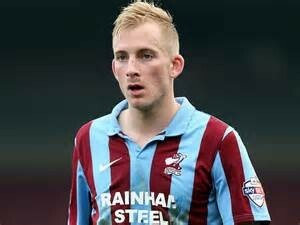 Darlington Football Club would like to announce the signing of midfielder David Syers. David, who is 28, has left Guiseley from the National League in order to join us on a contract basis. He started his career with Ossett Albion, then played for Harrogate Town, fFrsley and Guiseley before joining Bradford City in 2010. He played 59 times for Bradford, scoring 12 times, then in 2012 he moved on to Doncaster (41/5), Scunthorpe (46/10), and Rochdale (6/0) before being released by them at the end of last season. He has played twice for Guiseley this season, but has been unable to gain a regular place. David goes straight into the squad for Saturday’s home game with Gainsborough.